Posted on Wed, Apr 4, 2012 : 5:37 a.m.
University of Michigan Residential College art professor Larry Cressman’s line does more with less than just about any other artist's in Southeast Michigan. His River Gallery “Ground Cover/Covering Ground Drawings” in downtown Chelsea illustrate this principle through two differing kinds of art. Right. What’s most intriguing about Cressman’s display is the seemingly inexhaustible interest he takes in his gallery-large installation art as well as his now intently obsessive intimate drawing. Cressman’s sculpture is built through the patient accumulation of sticks, twigs, and paint. To borrow from his own words, his line is "real and physical—something that could go beyond the boundaries of flat, two-dimensional space—‘drawn’ line that could actually be held in my hand as a physical object. These are simple words to describe a highly complex sculptural art that makes its welcome reappearance in this exhibit. Cressman’s sculpture has become ever more challenging; its intricacy is apparent through concentrated study. These installations have gotten larger with their mobile element, as well. 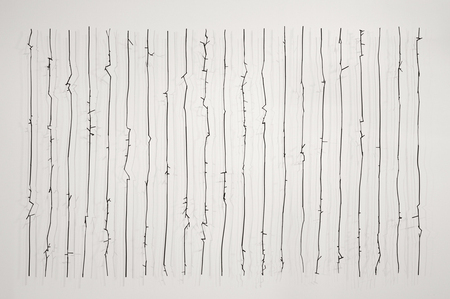 For example, Cressman’s handsome “installation drawing” of daylily stalks, graphite, polymer medium, glue, and monofilament “Landlines” illustrate his subtle interpretation of time and space through three-dimensional line. “Landlines” taken individually consists of a row of cobbled daylily stalks set in a horizontal pattern against the River Gallery wall. But there’s magic in what Cressman does with this “three-dimensional line.” Arranged symmetrically, his uniformly darkened daylily stalks playfully undulate slowly as they spin to create shadows slowly twisting in the opposite direction against the wall. “Cane Drawing III” (raspberry cane, graphite, monofilament); “Ground Cover I” (daylily stalks, graphite, pins); “Ground Cover II” (daylily stalks, graphite, pins); and “Ground Cover III” (raspberry cane, graphite, pins) all find Cressman playing with differing geometric patterns. And the installation drawing (raspberry cane, mullein, paper, graphite, polymer medium, wire, glue, and pins) “Harrow” finds him thinning his cane and mullein until it tapers into paper traces running across a River Gallery wall. But the master installation in this show is “The Nature of Drawing VII,” a revisiting of his 2009 13-by-13-foot wall-sized “The Nature of Drawing V.” In this instance, “The Nature of Drawing VII” is a slightly smaller, 9-by-14-foot, site-specific installation whose confluence of swaying, slender, intertwined patterns is remarkably more complicated than that earlier work. Repeating myself from that earlier exhibit (because the observation is still the same): Working at the exceedingly fine intersection of two-dimensional shadow and three-dimensional line, Cressman has created a memorable sculpture that’s as much one as it is the other. This might be enough for most talents—but not Cressman. He’s introducing a novel twist on tourism in this show that finds his art headed in yet another linear direction. As he tells us in his artist’s statement, “Over the last few years I have created a series of drawings with pencil in hand. “The photographic postcard, a ubiquitous object found when traveling, an object easily transported and accessed, became my chosen drawing surface. My procedure has been to drawn while traveling on a train between the sites that are depicted on each postcard. 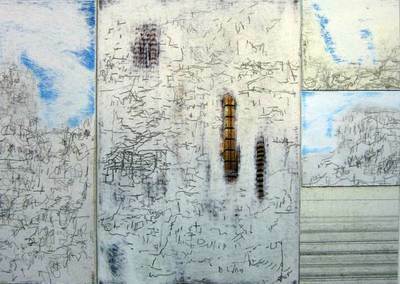 “Covering Ground IV (Siena)” shows what Cressman has in mind with its five contiguous grounds joined together to feature differing pencil strategies. And what’s remarkable about these drawings is his ability to blend what’s left of the postcard against the disciplined variegated line he superimposes on the postcard’s erased ground. For there’s certainly a lot of penciled ground covered in these modified postcards (as in hundreds of individual strokes); yet they’re also abstract settings whose visual complexity makes the new landscape vivid. Vaguely reminiscent of a miniature Chinese monochrome landscape, Cressman’s sketches—amazingly far more compact and expressive than his already expressive “Ground Cover” installations—are accumulative interconnections of another visual articulation. You can see for miles in these “Covering Ground” postcards. In fact, if you look closely enough, you can see miles far beyond landscape of miles in these “Covering Grounds.” Their patient accumulation of graphite traces will transport you where you want to go. “Larry Cressman: Ground Cover/Covering Ground Drawings” will continue through April 22 at the River Gallery, 120 S. Main St., Chelsea. Gallery hours are 11 a.m.-5 p.m. Wednesday-Saturday, and noon-4 p.m. Sunday. For information, call 734-433-0826.